UNITE HERE! is a union of workers throughout the U.S. and Canada who work in the hospitality, gaming, food service, manufacturing, textile, laundry, and airport industries, the majority of which are women. The Textile Workers Union of America was formerly the Amalgamated Clothing and Textile Workers Union (which merged with the Amalgamated Clothing Workers of America). All of these eventually became UNITE HERE. In 1995, the International Ladies Garment Workers Union (ILGWU) joined forces with the Amalgamated Clothing and Textile Workers' Union to form UNITE!. In 2004, UNITE announced that it would merge with the Hotel Employees and Restaurant Employees Union (HERE) to form UNITE HERE. In 2009, more than 150,000 UNITE HERE members left the union and united under the new name, Workers United. General Officers elected 30 June 2009. On June 13, 2002 Boston Democratic Socialists of America presented its 25th Annual Debs–Thomas–Bernstein Awards to "leaders who fight for democracy, here at home and around the world". State Representatives Pat Jehlen and Anne Paulsen, Co-Chairs of the Progressive Legislators Group received the award. Ellen Feingold, the earliest known recipient (1979) spoke on the history of the organization. David Knuttunen and Susan Davidoff were benefactors of the reception. UNITE HERE was a patron of the reception. 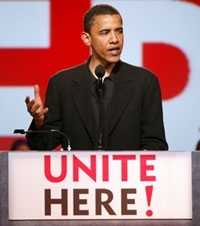 Barack Obama was sworn in to office wearing a tuxedo made by UNITE HERE members at Chicago's Hart Schaffner Marx factory, which UNITE HERE says demonstrates the pro-worker values that he will bring to the Presidency. This page was last modified on 25 February 2011, at 02:44.